Take a free, fun, hands-on instructor training workshop (4-6 hours). 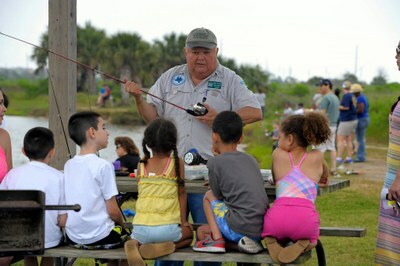 Learn to teach fishing basics to children and adults in your community. Check the calendar for angler education workshops coming up near you. For more information on getting your angler education instructor certification, please see our brochure (PDF). Basic Fishing classes introduce participants to: equipment, knot tying and tackle assembly; casting and fishing skills; fish ID and habitats; regulations and ethics; and safety and stewardship. Advanced Fishing classes provide more advanced experiences in both fresh and saltwater fishing, as well as information about both fresh and saltwater aquatic environments. Basic Fly Fishing is an introduction for children (ages 10 and older) and adults to become familiar with: fly rods and reels; tackle assembly; flies and fly tying; proper casting techniques; aquatic habitats; regulations and ethics; safety and stewardship. Intermediate Fly Fishing provides additional knowledge and skills. Children (ages 10 and older) and adults learn to: identify fish and fish habitats, tie fly fishing knots and flies, understand fishing regulations, properly handle fish and cast safely. Please see the calendar to find upcoming fishing classes and events in your area. Documentation of your fishing classes and events are vital to the success of our program. View the Reporting Guidelines to ensure your reports meet all policies. Watch this video to see how easy it is to report online. Recycle Fishing Line: (PDF) How to make a collection tube for old fishing line, courtesy of "Fishing's Future"
State Fish Art Contest: Students in grades 4-12 in any school (including private school or home school) are invited to submit a drawing of an officially-recognized state fish as well as a one-page essay about its behaviors, habitats or conservation status. Students in K-3 may also submit a drawing, with no essay required. Why did you volunteer to become an angler educator? I enjoy the outdoors and love teaching children skills to make them love the sport of fishing. From my experience, I see that many children have few opportunities to learn how to fish. When parents get involved in the learning, children find it more meaningful for them. I became a volunteer to be able to work with kids, and teach about fishing and outdoor activities, as well as stewardship of our lakes, rivers, and streams. Most importantly, I volunteer to pass on the passion of fishing that was instilled in me as a child, and promote family unity with outdoor activities.